You know the story. You arrive at the airport frazzled. Thoughts of “What did I forget?,” “OMG this line is insane,” and “Please don’t let me be squished between a loud chewer and a someone with smelly feet” (just me?) bombard your brain. And that’s just the beginning of your travel day. Intense crowds, time changes, being in close quarters with family or strangers, unhealthy food, stimulation overload…travel can be unnerving at best and anxiety-inducing at worst (especially around the holidays). But let’s be honest, it’s totally worth it. 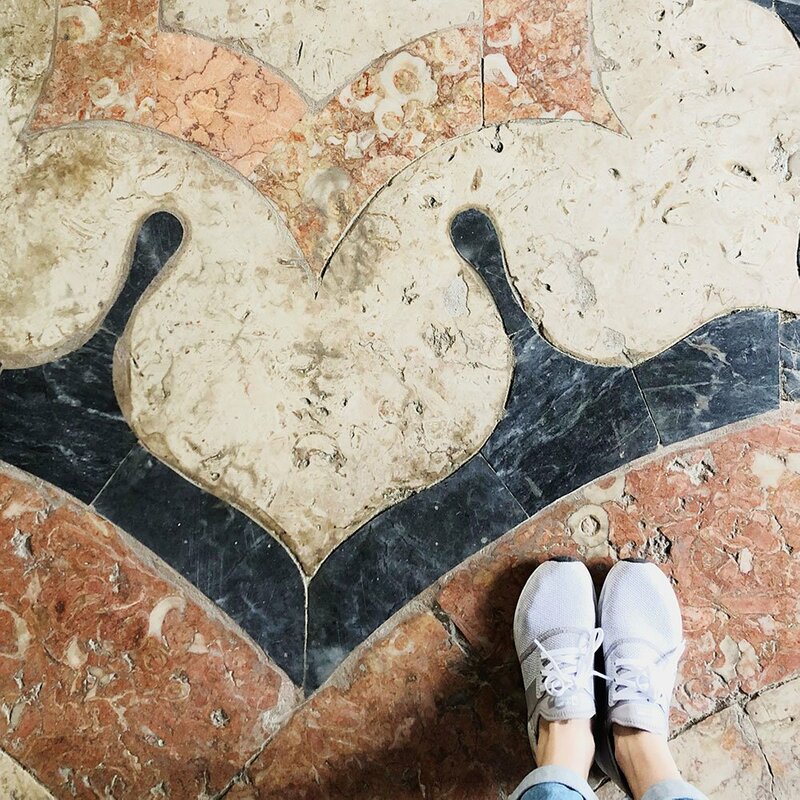 The good news is that with even the most frazzling travel experiences, there are tried-and-true ways to feel calmer and more centered throughout your trip. Simply put, grounding techniques can help you stay rooted in the present moment, manage overwhelm and regain focus when you feel scattered, unsettled and anxious. The trick is to get out of your head and into your body. This can be done by engaging your senses, practicing mindfulness, exercising or distracting yourself. I’m not an anxiety expert, but here are some of the grounding techniques that help me beat travel anxiety and get back to enjoying the journey. We all want to experience our destination fully, to connect lovingly with family when we visit home and breeze through airports with Zen-like grace. Here are 10 ways to ground yourself the next time travel overwhelms. Box breathing: Sometimes called four-square breathing, this breathwork technique is a simple way to calm down your nervous system and bring you back into the present moment. And the best part? You can do it anywhere, anytime. Standing the security line, on your flight, trying to fall asleep in a new bed, any place. Here’s how: breathe in for four counts, hold your breath for four counts, exhale for four counts. Repeat. Try to breathe deeply from your belly, not from your chest. Sit in silence: If you’re a highly sensitive person, like me, and triggered by loud noise and commotion, this tip is extra handy. You don’t need to think of it as meditation if that feels intimidating. Instead simply sit in silence, alone if possible, breathing deeply. Practice watching your thoughts as a third party observer rather than reacting to them. If you can’t get away, try wearing noise-canceling headphones or listening to calming music. Feel the ground: Let’s get literal, shall we? Ground yourself by actually feeling the ground. Shoes off, feet in the grass or soil. Take in your surroundings with all of your senses and repeat to yourself, “I am here. This is the ground.” Sounds super ridiculous, I know. But it does help to bring your scattered self back to the present moment. Journal: Thoughts racing through your head like a pack of wild horses? Whip out a notebook or journal. Heck, even a napkin will do. Write down whatever comes up. It doesn’t have to make sense. It certainly doesn’t have to be good writing. No one will see it. It’s a mental purge. Writing things down on paper has a calming effect and will also help you organize your thoughts. A win-win. Be early: Do everything you can to give yourself ample breathing room when it comes to transportation or arriving at the airport. Nothing will spur travel anxiety faster than panicking about missing a flight or another event. Truly connect: If you’re feeling anxious, having a heart to heart with someone might be the last thing you want to do. You don’t have to spill everything, but sometimes have a heartfelt conversation with someone can make you feel seen and heard in a comforting way. On the other hand, giving someone else your undivided attention can help you feel more connected and less alone. And it probably means a lot to them too. Rub a rock: Or a crystal or pebble or anything interesting you can keep in your pocket. Whenever you start feeling jittery or nervous, take it out and look at it with 100% of your focus. Feel it with your hands. Notice its color or texture. Use all of your senses to examine the object and feel yourself calming down. Put down your phone: More and more studies show that social media use may cause anxiety and depression. Whether you’re scrolling through your feed or reading the latest disturbing news, we’re constantly infiltrated with reasons to feel less than, envious or just sad. Swap the screen time for real-life moments and be where you are. Visualize: Another great tip for overcoming travel anxiety is to imagine yourself in a calming, beautiful place, whatever that means to you. What does that place look like, feel like, smell like, sound like? Again bring all of your senses into play. Avoid food that makes you feel bad: Consuming nourishing foods and drinks like root vegetables, broth, protein, tea and a lot of water will help you feel centered and grounded. Too much caffeine, sugar or refined carbohydrates (e.g. white bread, crackers, pasta) contribute to anxious feelings, brain fog and lethargy that can make you feel scattered and unsettled. 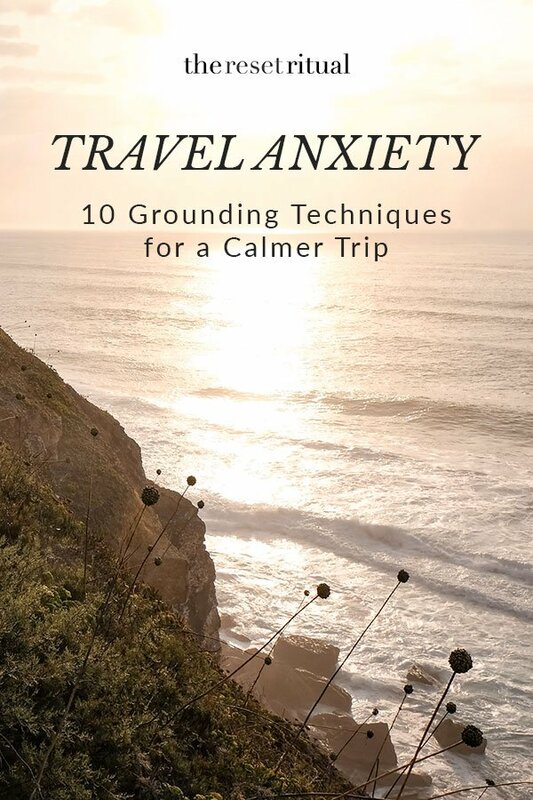 Have you ever used any of these grounding techniques to overcome travel anxiety?